Argan oil is well known for it's healing & rejuvenation properties. Rich in vitamin E, essential fatty acids and antioxidants, there is no wonder it's refered to as "liquid gold" for hair and skin. 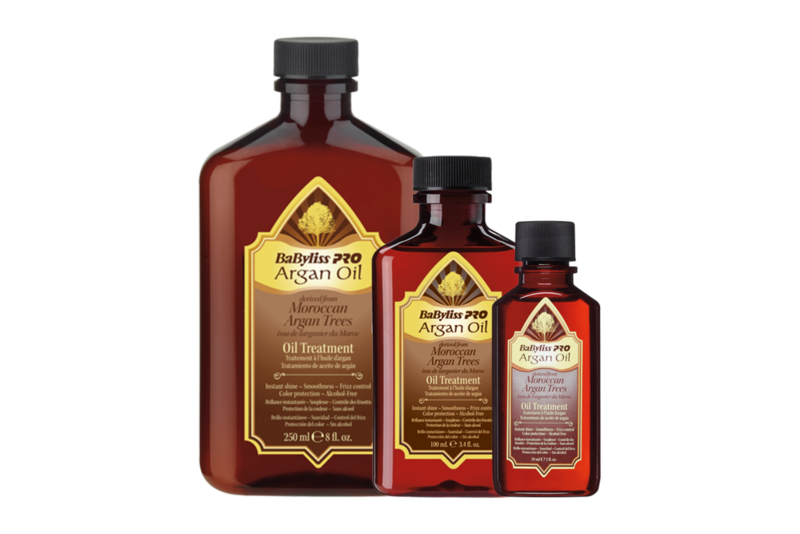 BaBylissPRO brings pure Moroccan argan oil to a collection of hair care products to protect your hair, weather it's thick & untamely or thin & fly-away prone. We will give you an inside look at the top three products available and how you can get the most benefit from them. Argan Oil is a revolutionary beauty booster which will immediately amaze you with its ability to moisturise, hydrate and soften all types of hair. It’s clinically proven to improve skin hydration, blood circulation & skin elasticity. If the science isn’t enough, celebrities such as Eva Mendes, Taylor Swift and Salma Hayek swear by Argan Oil for the hydration and overall health of their hair and skin. People are continuously coming up with new uses for this magical serum. Basically argan oil helps you look & feel gorgeous from head to toe! Infused with pure Moroccan argan oil, BaBylissPRO have a full range of haircare products available for hair care & hair styling needs. The range is dedicated to creating & maintaining smooth, shiny & frizz free hair, all year round! Online reviewers all attest to the many benefits! This product helps make hair silky soft & smooth without leaving it greasy. Use pre-blowdry to detangle and protect and post-blowdry for incredible shine. Not to mention it smells amazing! This ultra-lightweight cream is a great all-rounder, defining texture with a flexible hold, all while hydrating your hair. Amazing control of frizz & fly aways, perfect for those humid summer days. Incredibly lightweight and silky for all hair types. Spray on wet or dry with no oily residue. Highly regarded amongst online reviewers for having noticable, long lasting results. No more dry hair! This smooths hair cuticles to help eliminate frizz and repair dry, damaged hair.